NITA’S FIRST SIGNS and more now available in the DCI Online Bookstore! If you have followed me for any length of time, you are probably aware of how proud I am to be affiliated with an amazing organization called Deaf Camps, Inc., a volunteer-run non-profit organization dedicated to providing fun, safe, communication-rich camps that promote the physical, spiritual, and social development of Deaf/hard of hearing children and children learning American Sign Language. You may recall that my launch party for my debut novel, Sword and Verse, was a gala fundraiser that raised scholarship money for Deaf Camps, Inc. I have been volunteering with this organization since 2001, and have been on the board since 2003. I have volunteered at camp every year and served in various capacities on the board. Currently I am DCI’s treasurer and director of the Interpreter Internship Program. So I am pleased to announce that from now on, autographed copies of all my books – along with some terrific bundle deals! – will be available in Deaf Camps, Inc.’s Online Bookstore, with all proceeds going directly to Deaf Camps, Inc.’s scholarship program. To have a book personalized, simply note name(s) in the comments section on the order form. And remember, signed books make excellent holiday gifts! Order now! Order now from the Deaf Camps, Inc. Online Bookstore (autographed copies that support a great cause!) or the ALA Store. coding for each entry indicating which Common Core State Standards for Kindergarten skills it supports. 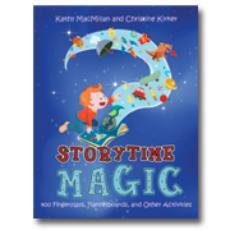 Using the guidance and activities contained in this book, storytimes will be more magical than ever! Order now from the Deaf Camps, Inc. Online Bookstore (autographed copies that support a great cause!) or from the ALA Store or from amazon.com. 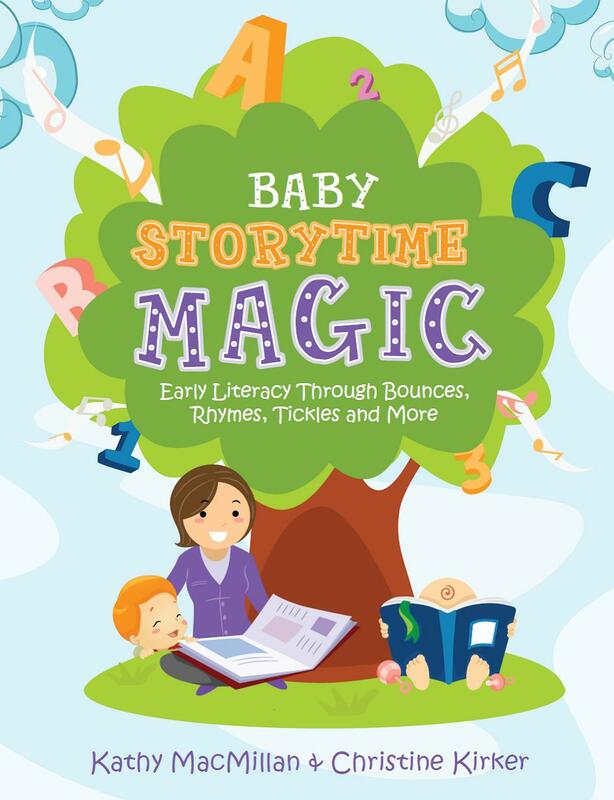 Packed with ready-to-use activities, reducing prep time substantially, this book is a valuable early literacy tool for every children’s librarian. Click here for a preview of material from the book. by Kathy MacMillan. Huron Street Press, 2013. Order now from the Deaf Camps, Inc. Online Bookstore (autographed copies that support a great cause!) or from amazon.com. All those reasons are great, but the best reason to start signing with your child is that signing with babies, toddlers, and young children improves everyday life and communication. A child who can express him or herself with the aid of signs is far less likely to get frustrated and throw tantrums, and can initiate conversations about topics that interest him or her, which leads to adults talking more about those topics, which leads to a motivated and interested child absorbing more spoken language, which helps develop spoken language skills. Signing with children naturally complements other language and literacy activities such as books, fingerplays, rhymes, and songs. 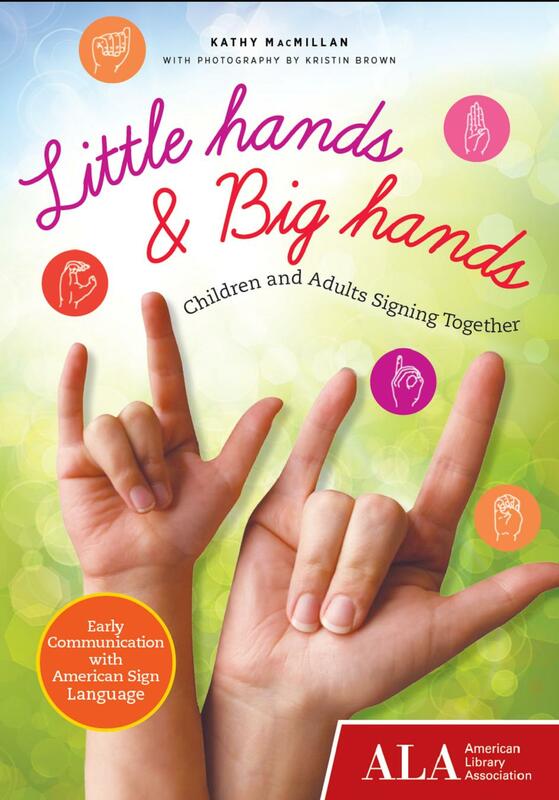 Little Hands and Big Hands offers solid background information on signing with children ages birth to five, along with hands-on games, fingerplays, songs, and more that parents can use throughout the day to smooth transitions, calm a fussy child, or engage a stubborn one. Each activity is accompanied by photos of the relevant signs. Even better: the book features American Sign Language, which, as a real language, stimulates children’s language development in a way that made-up gestures can’t. 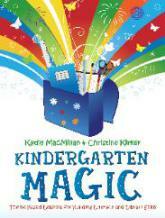 Author Kathy MacMillan is a nationally certified American Sign Language interpreter and has been sharing the joys of signing for years through her “Little Hands Signing” programs for children and families. 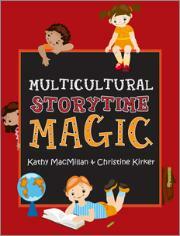 Find out more about her signing classes and storytelling programs here.